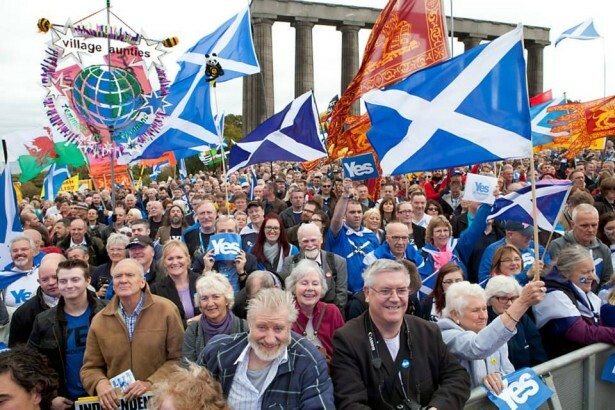 With the referendum less than a year away, campaigners are already busy mobilizing previously apolitical Scots for and against independence from the U.K.
All across Scotland, there is no story more newsworthy than that of the Independence Referendum. From the mainstream media to social media, from universities to town halls, everyone has something to say on the subject. Voting day — September 19, 2014 — is less than a year away, but campaigners are already mobilizing. While groups like the National Collective and Yes Scotland urge people to vote for an independent Scotland, Better Together and other pro-union groups argue it would be in everyone’s best interests to remain part of the United Kingdom. As it stands, Scotland operates within the United Kingdom on a devolved system of governance. While the British government — headed by Prime Minister David Cameron from the Conservative Party — decides on the U.K.’s foreign policy, defense, social welfare and the economy, the Scottish government — headed by First Minister Alex Salmond from the Scottish National Party — is given an annual budget to decide on policies regarding agriculture, education and the environment, among others. A vote for independence would give the Scottish government the ability to decide on all policies affecting Scotland, as well as the fiscal power to carry them out. It would also mean that Scotland would have to depend on its own revenue and resources. It’s a debate with many facets, from politics and economics to culture and identity; more than enough to keep the current affairs talk shows buzzing. People are used to living as part of the U.K., and the thought of breaking away can seem frightening and expensive. Others wonder about the wisdom of messing with the status quo. Colin Williamson has been volunteering with Yes Scotland since it was set up in 2012, and often goes canvassing door-to-door in Edinburgh East. He says he’s seen more and more interest as the country creeps towards voting day. “We’re at a stage where we’re talking about what kind of country we want to live in, and how to achieve it,” Williamson said. There’s plenty to talk about, and both sides have put forward their strongest arguments for and against independence. “The real question is what is best for Scotland and her future,” wrote Glaswegian Shiraz Ahmed in an email. “I am proud to be Scottish I want what is best for Scotland and I believe being part of the U.K. allows Scotland to stand taller. Being part of the U.K. enables Scotland to have a say on the U.N. Security Council, the G8 and other international organizations, some things that we will struggle to join as an independent nation.” He’s a dedicated member of Labour Diversity, an organization of the Labour Party that is also part of the Better Together campaign. The situation is similar with Better Together. Although its core is formed by three unionist parties — Labour, Conservative and the Liberal Democrats — many campaigners involved come from non-party backgrounds. It’s a sign that the referendum has motivated even previously apolitical Scots. Despite this, the fight is far from won. Opinion polls show that as of October 2013, only 25 percent of those polled think that Scotland should be an independent country. Forty-four percent think Scotland should remain as part of the U.K., while 31 percent remain undecided. If Scotland were to vote tomorrow, independence will remain a far-off dream. In a show of strength for Yes Scotland and other pro-independence groups, in September thousands thronged the Royal Mile in Edinburgh and marched through the city to a rally with prominent activists and politicians. The organizers’ efforts have plenty to offer voters. Beyond door-to-door canvassing both sides often engage in public debates, encouraging people to listen and choose for themselves. The National Collective has launched Documenting Yes, a project for photographers following the Yes campaign, while Better Together has introduced Academics Together to argue that Scotland’s universities benefit from being part of the union. And at the end of November the Radical Independence Campaign will have its second conference, a sequel to the 800-strong one last year. A year is a long time in politics. With determined activists working constantly to engage and persuade more people, it’s too soon to predict which way the referendum will go. But one thing’s for sure: regardless of the result, Scotland will never be the same again.